We were not wrong in predicting that the Okhotsk Sea drama still had a way to go. 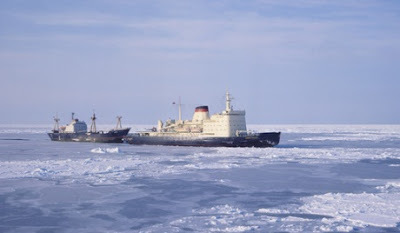 The latest news from the Russian media (as of early morning Moscow time) was that the icebreaker Admiral Makarov was currently towing to safe waters the 1,300-ton trawler, Mys Yelizavety (Cape Elizabeth). The ship has been singled out for attention as it was less than half a mile from the shore and was in danger of being grounded by the moving ice. This operation was separately reported by TASS to have been successfully completed, and the picture above purports to show the pair of ships on their way to the open sea. Significantly, this appears to be a "close coupled tow" which we referred to in our earlier piece (good videos here and here illustrating the technique), a stratagem adopted inter alia in very cold or windy conditions when the ice is likely to close up immediately behind an icebreaker. We also see in the report a reference to "hummocked" ice, which is largely a wind effect, but can make ice navigation very slow and dangerous. The story thus takes on a new dimension as we learn that, with the successful rescue of the Mys Yelizavety, the icebreaker Magadan, which was first on scene in an attempt to effect a rescue, has itself got stuck in the ice. With five ships stuck in the ice, and one now freed, the number is back to five. The other ship is identified as the Anton Gurin, a trawler registered in St Petersburg. We are told that the Admiral Makarov is "moving at full tilt" to help the Magadan, although we last heard from the Makarov's captain that progress through the ice was very slow. That is likely significantly to delay the rescue of the other ships. But, if the Mys Yelizavety needed a close coupled tow to get it out, the big question is how the giant 32,000-ton Sodruzhetsvo will be got clear. The 14,000-ton Admiral Makarov is a powerful ship, delivering 36,000 shaft horsepower – against the 5,000-ton Magadan with 13,000 horsepower available – but it would struggle to drag the Sodruzhetsvo clear. 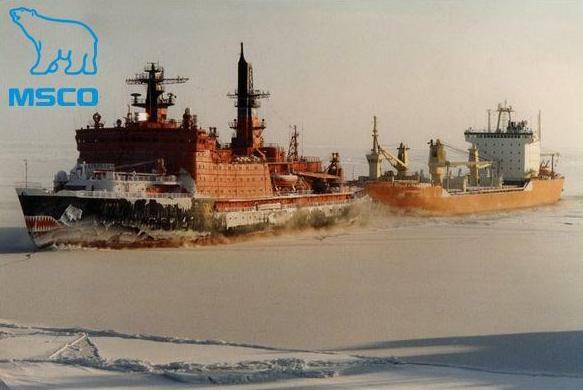 Even the Russian flagship, the nuclear-powered 50 Let Pobedy, with 75,000 horsepower (pictured above is the Yamal, dragging an 20,000-ton SA-15, I think, in a close coupled tow), might have difficulty. According to further reports, rescue efforts have been "hampered by weather conditions, storm winds and heavy snowfalls," and "unusually cold weather of up to -17°C" is being experienced. Furthermore, weather forecasts are unfavourable. Temperatures may plunge even further and a storm is expected in the area late Thursday/early Friday. The implications of this weather are obvious in an area that was said to be "sensitive" to global warming, and had a recent history of declining ice formation. But what is also fascinating is the poor and highly inaccurate coverage by the British (and western) media, which seem unable to appreciate the magnitude of the drama that is unfolding. With over 400 lives at risk, and no certainty that a speedy rescue can be effected, one might have thought that greater interest would be shown. UPDATE: Latest is that the Admiral Makarov has now reached the Magadan and is assisting it to break free of the ice. The Anton Gurin, meanwhile, is reported to have broken free on its own. The position of the other ships is stable, says Admiral Makarov's captain, Gennady Antokhin. The icebreaker is due to reach these remaining three ships by midnight local time (1400 GMT - about now, at the time of writing). "The ice is very serious, frozen in layers, covered in snow and hard to pass through. It sticks onto the ship," says Antokhin. "I think this will not be a very quick operation." Are they at all surprised? She's out – one to go!